Over the next several weeks and months, I’ll be following with great interest the story about the planned development of a 50-unit apartment building with no on-site car parking. The reason for my fascination with this project is that absolutely nobody knows how this will shake out in terms of whether it attracts car-free residents and reduces automobile mode share, although apparently everybody has a guess or an opinion on the matter. But until something like this is tried, and tried in close-in Portland, it really is all guesswork. Determining the parking demand for a new development falls squarely within the realm of traffic engineering, and to accomplish this, we generally turn to a publication of the Institute of Transportation Engineers, Parking Generation, for guidance. For low/mid-rise apartment buildings in an urban setting, Parking Generation tells me that the peak demand will be 1.2 parking spots per dwelling unit. Thus, to support a 50-unit building with no on-site parking, the neighborhood would have to accommodate about 60 new vehicles on-street (and a whopping 81 to meet 85th percentile demand)! So the neighbors are right to be up in arms, no? To channel Lee Corso on this beautiful fall morning, not so fast my friend! A closer look at the data upon which this number is drawn is revealing. The urban areas where the study apartment units are located are Dallas, TX, San Francisco, CA, Syracuse, NY, Santa Barbara, CA, Long Beach, CA, Santa Monica, CA, and San Diego, CA. All but one–San Francisco–seems to be a city that drives significantly more than Portland. And the data from Frisco is from 1982! Remember rocking out to Olivia Newton John’s Physical and watching ET phone home? Morning in America? But I digress. Even the newest data in the set is now more than a decade old, with car havens Santa Monica and San Diego having contributed data in 2001, back in the good ol’ days of gas selling for less than a buck and a half per gallon. Let me reiterate: this is the best available data that we have for parking demand. (Hence the old joke among number crunchers about the acronym for “best available data”). That’s why I opened by claiming that nobody really knows how this will shake out. It is also important to note that for all of the apartment buildings in the study, on-site parking was provided to the tune of 1 space per dwelling unit on average. That this supply is filled and slightly exceeded at its peak is an instance of the concept of demand elasticity, a well known economic idea that applies to areas like transportation as well. Regarding transportation infrastructure, I call this the “Field of Dreams Principle:” Build a highway and people will drive on it, build a bike facility and people will ride in it, build a parking spot and people will park in it. As it pertains to parking in particular, Donald Shoup wrote a fantastic book on this topic, The High Cost of Free Parking, which should be required reading for anyone who wants to express a strong opinion on these parking-less apartments. One other point worth making is that it’s hard to go very long these days without seeing some sort of article or paper on how the folks currently coming of age–the generation called millennials–prefer to live in more urban areas, drive less, and are less likely to own a car than any other recent generation. Increasingly, I’ve seen it argued that cell phones are replacing cars as the must-have rite of passage for teens and young adults, their way of socializing and their symbol of freedom and status. An apartment building like the one in question seems to be a fit for this new reality. In a sense, I understand why homeowners in this area would be practicing a bit of NIMBY-ism regarding this project. I hope by this point I’ve convinced you that the actual amount of vehicular parking these apartments will require is truly unknown, and it’s a hard sell convincing people that their neighborhood is a good one for experimentation. But merely the fact that no on-site car parking is offered will restrict the parking demand of these apartments to some degree. Throw in some killer bike parking, maybe provide a transit pass with rent, get a bike-share station in front of your building, or really go pie in the sky and convince The Man to (finally) install a decent bike facility on Hawthorne, and all of a sudden I think it’s pretty likely that the on-street parking impacts would be minimal. I’ll leave it to my planner friends to argue why more density without more cars would be a terrific thing for the city’s vibrancy, but it sure as hell sounds like a place where I’d want to live. I’m happy to announce that my paper “A Methodology to Evaluate the Competitiveness of Electric Delivery Trucks” has been published in Transportation Research Part E: Logistics and Transportation Review. The paper, written with Dr. Miguel Figliozzi, develops a model for comparing the cost of electric delivery trucks to conventional trucks based on logistical parameters (e.g., number of customers, density of customers, average weight of deliveries, etc.) and other factors like gas prices and battery costs. At present, conventional trucks are still slightly less expensive in most scenarios, but it’s unlikely that they will be for very long. In the near future, the combination of declining battery prices and rising fuel prices will render electrification the financially more prudent decision. Assigning a cost to emissions (quantifying emissions differences is the subject of a paper I recently submitted to the Transportation Research Record) or assuming that a company gains some financial benefit from the positive PR associated with “green” practices further favor electrification. The key takeaway is that you’ll be seeing many more electric trucks on the road in the coming years, as they can adequately serve the needs of most urban delivery scenarios at a cost that rivals conventional trucks. As far as the air quality difference, you’ll have to wait for my next paper to find out if electric trucks reduce emissions or not (spoiler: they do). The “official” paper’s DOI is http://dx.doi.org/10.1016/j.tre.2012.07.003. You can read the final, unformatted version here. A Near Miss, and the Advice from Mr. Miyagi that Might Have Prevented It. I spend a decent chunk of time looking at crash histories, and one underlying truth is that when a crash happens, generally several things went wrong that led to it. In other words, there’s rarely one guilty party (and when there is, the little box on the crash record indicating whether alcohol was involved is usually checked). So when the video below was posted on BikePortland on Friday, it struck us folk in the Lancaster Engineering office as a classic example of multiple guilty parties with a little bit of ill-conceived infrastructure to boot. It’s a good thing it wasn’t more serious, and it’s worth some careful and detached analysis to think about how things like this could be prevented. 1. Watching the first few seconds of the video (and knowing it would end with a crash), I was pretty certain that it was going to end with the person filming getting right hooked. The gentleman filming leaves the bike lane to make a right turn, but then passes vehicles that are in the right-turn lane on the right. Not a good idea. The fact that he was presumably turning right on the bike/ped path before the cross street makes this time-saver tempting, but I think there’s just too much that could go wrong to make this a safe maneuver. A much smarter way to approach this turn would be to line up at the back of the queue, just right of the center of the lane, and clearly signal your intention to turn right. This keeps you off of that pesky drainage grate, and ensures that the motorists (who clearly aren’t looking for you at this intersection) can’t NOT see you. To make our streets “complete” and build a transportation system that’s people-centric rather than vehicle-centric, legal movements on red should be the first thing to go, at least in urban areas or anywhere with decent numbers of non-motorized traffic (bikes, peds, skateboards, segways, etc). 3. Now, here comes the part where I make all of you hate me (well, maybe not any truckers or ODOT officials that happen upon this blog): the person on the bike was not riding very intelligently here. I wish we lived in a world where our traffic laws were enforced to a degree where motorists were truly compelled to follow them to the letter, but we don’t. We’ve also inherited an infrastructure that favors one particular mode of transportation–the motor vehicle–above all others (Many of us are working to fix that, but it takes time). With this in mind, one of the best pieces of advice I’ve ever heard regarding bike safety was given to me by a DC bike messenger friend (back when our nation’s capitol still had a big, vibrant bike messenger ‘culture,’ so to speak): Ride like you’re invisible. At an intersection like this, I think you simply need to operate under the assumption that the people in cars stopped at red lights are not looking for you and are not going to see you. Forget the traffic laws and ignore the fact that you’ve got the right away–the laws aren’t enforced, and besides, you’re invisible. Slow down before entering a conflict area like that one and ensure that you’re seen by making eye contact. I think that last point is key. 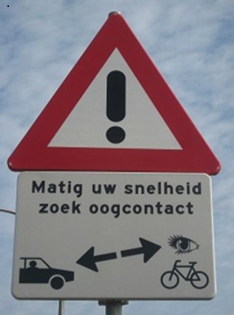 As any sort of “vulnerable” road user (read: not protected by two tons of metal and an airbag), force drivers to acknowledge your presence by meeting their eyes, and you’ve just cured your invisibility problem. As a general rule, I try to remain as neutral as I can regarding most political occurrences, so that I am able to analyze problems and interactions from an unbiased, scientific perspective. But the transportation bill that has been introduced in the House is fatally flawed in so many ways, and would threaten much of what I hope to accomplish professionally if passed. So in a rare moment of activism, I’ve joined in today’s campaign to produce letters and phone calls in opposition to the bill. I imagine that I’m preaching to the choir here a bit as Ms. Bonamici is almost a certain “no” vote, but here is the letter I sent to her this morning. Congratulations on your recent election as Representative of the 1st District of Oregon! I wish you the best as you serve our terrific region in the Capitol. You assume this position just in time to vote on one of the most pivotal pieces of transportation legislation of my lifetime, H.R. 7, and I am writing to encourage you to resoundingly vote “no” on this bill. Secretary LaHood said of this bill that it’s “the worst transportation bill [he’s] ever seen during 35 years of public service,” and it’s not difficult to understand why. The bill reinforces our reliance on oil for transportation and fundamentally alters the way transit is funded in the US, essentially replacing all transit monies with a promise for future funds that will be hard to keep. It doubles down on an unsustainable approach to transportation that has reduced the livability of our cities, polluted our air and water, and compromised our national security by rendering us dependent on politically unstable nations for fuel. This bill addresses none of the fundamental problems facing the transportation sector. It reinforces the false notion that our 18.2 cent-per-gallon gas tax is adequate to fund our freeways, while relegating the other modes of transportation to second-class status. The truth of the matter is that we must find other revenue streams to supplement the gas tax, and put these toward a multi-modal, sustainable transportation system that is both solvent and capable of accommodating aggressive economic growth. These are big, systemic problems, and meeting the challenges they represent requires much more than the backward-thinking, politically motivated bill that is under consideration. As I’m sure you know, Oregon has a history of leading the way on transportation issues. Our willingness to challenge orthodox thinking and innovate when faced with transportation challenges is unmatched, and we must not be too humble to suggest that other regions would be well-served by following our model. I am confident that you will represent this spirit with your “no” vote on H.R. 7, and I appreciate your leadership in this matter. 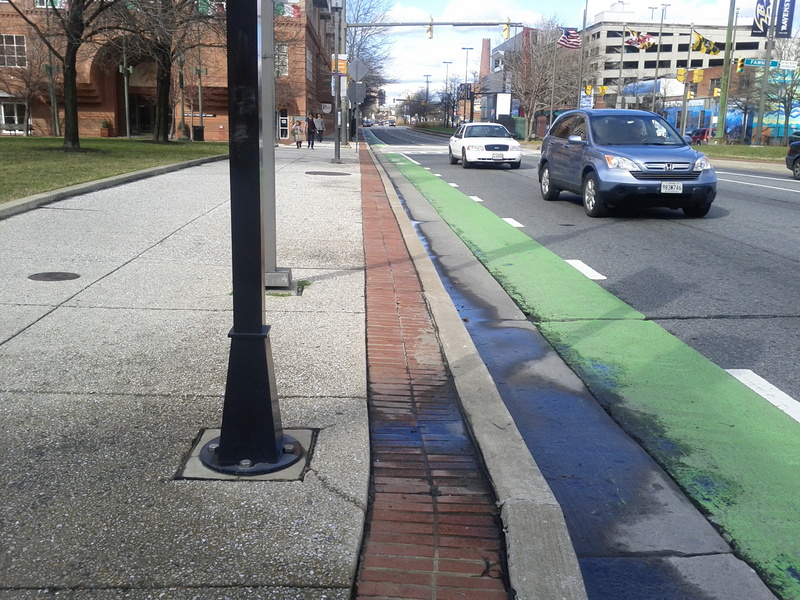 When I came to this bike lane in Baltimore, I had to stare at it for a minute or two before I realized why it looked so unusual to me: it is the first time I’ve seen a bike lane in the US that is painted green for its entire length. In Portland, we started using green paint a few years ago in our bike boxes and have since expanded its use to other conflict points, like the weave area after the start of a turning lane where cars are crossing the bike lane. As a driver, the green paint is effective at grabbing your attention and reminding you to double check for cyclists before entering that area. 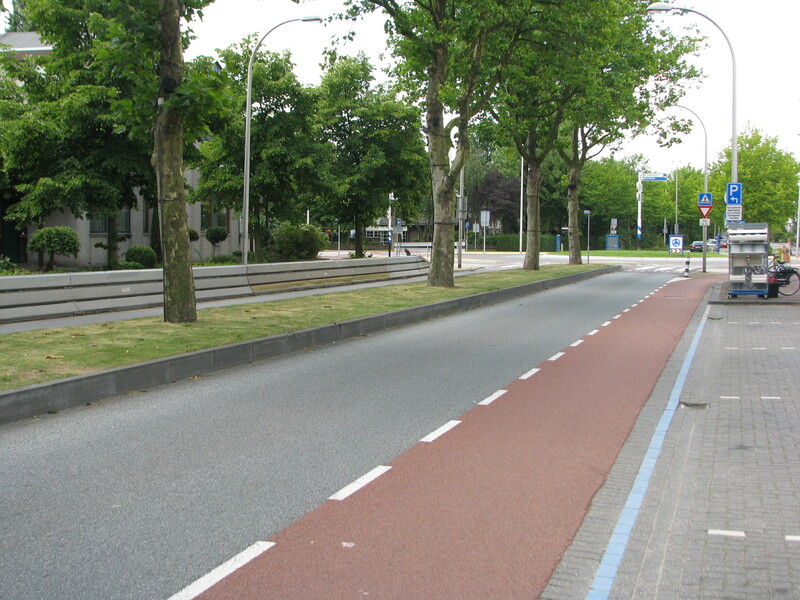 In visiting the Netherlands this summer, I was struck by the fact that most of the bike facilities there are paved with red asphalt. I don’t know if it actually accomplished anything on the network of cycletracks (other than the fact that it looked really cool! ), but on shared roads it was a clear way of demarcating which parts of the road belonged to which modes. One thing that’s consistently frustrating as a cyclist is when cars stop in the bike lane. Something tells me I’m not alone there. I’d imagine that, if nothing else, coloring your bike lanes is marvelously effective at reducing this, and it probably helps keep moving cars from drifting into the bike lane as well. But I wonder if using color for a whole bike lane might reduce its effectiveness at conflict points, where it’s no longer a drastic change that grabs a driver’s attention. Conversely, maybe ubiquitous color serves as a constant reminder that lots of people use bikes on the road in question. Perhaps the color also helps with the public relations aspect, such that the “interested but concerned” pool of potential cyclists is encouraged by the literal and figurative visibility of the infrastructure. But is this all worth the fairly significant (as bike projects go, at least) extra cost of coloring these lanes? I spent a large chunk of my 20’s doing information design, and so I’ve long been interested in the usage of colors and how we react to different colors displayed in different situations. This is an interesting topic, and I’ll be curious to see how cities use color like as they build cycling infrastructures and how it winds up working. Day 2 of the Annual Meeting of the Transportation Research Board was an exercise of trying (and, alas, failing miserably) to be several places at the same time. As I’ve developed research interests in freight logistics and traffic signal timing over the last year, I’ve noticed that there haven’t been too many efforts to link the two or explore the synergies between operations and freight sustainability. That point was driven home on Monday, as the freight sessions and meetings conflicted with the signal systems meetings for most of the day. My morning poster session prevented me from attending a signal systems meeting that I was interested in; the committee that sponsored my session met in the afternoon at the same time as another compelling operations committee. Luckily, I did get to see some terrific posters on both subjects over the course of the day before again lamenting the fact that there’s only one of me in the evening, as several receptions I wanted to attend took place concurrently. I had some wonderful conversations during my poster session, particularly around a topic that I’ve been trying to figure out for quite some time: estimating a monetary consequence of being seen as a sustainable or “green” company by one’s customer base. And anyone who thinks freight logistics is a dry subject certainly wasn’t in attendance at the committee meeting yesterday, which got quite contentious as it became clear that some folks there, um, didn’t exactly care too much about issues like multimodalism or sustainability. But the clear highlight of the day was at a reception in the evening when Portland State’s own celebrity-noveau Jesse Boudart took to the baby grand piano. I’m currently in Washington, DC for the 91st Annual Meeting of the Transportation Research Board. Needless to say, there’s a lot happening this week worth reflecting on, but I thought I’d try to write up some quick daily summaries of my experiences here and expound on them in more detail when I return to Portland. This year, I’m honored to be participating as an Eisenhower Fellow, and the first of the Eisenhower research showcases took place Sunday morning to highlight some of the cutting-edge doctoral research that my fellow Fellows are performing. I was extremely impressed with the both the quality of the research itself and also the presentation skills of the folks conducting it, and frankly it intimidates me a bit in anticipation of my own presentation at Tuesday’s showcase. This isn’t necessarily a bad thing, as I think it will inspire me to practice away the parts where I’ve wrestled with words when giving this presentation previously. In the early afternoon, I attended a fascinating workshop that featured city officials from five different cities across the country presenting brief synopses of innovative bicycle treatments and facilities that have been recently put into service. That was a very encouraging session; a lot of cities that previously were difficult to bike in are becoming very bikable now, and I hope I get to ride in them someday. A big takeaway was that performance metrics are hard to come by, but it seems to be the case that better facilities encourage more cycling. While we might have expected this, it’s still good to know that good work from transportation engineers helps bring about the desired result. I finished off Sunday by touring the exhibit hall and attending Kittelson and Associates’ reception. Kittelson has a big presence in Portland so it was a must-see event for us Portland Staters, and the exhibits are a must-see for everybody. PTV, a Portland-based company that manufactures simulation software called VISSIM, had my favorite exhibit with a gnarly three dimensional model of Portland’s transit mall. My old friends at the University of Iowa were a close second, bringing a fully functional driving simulator into the hall. The Kittelson reception, as all receptions, was extremely valuable for meeting people, having short conversations learning about the work that folks are doing, and the like.